Wincest. . Wallpaper and background images in the Wincest club tagged: dean winchester sam winchester supernatural wincest love. 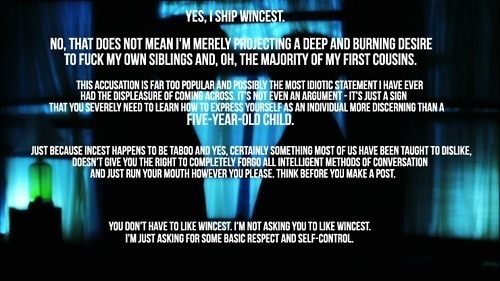 Considering that Wincest extols the greatest virtues of unselfish love and sacrifice, lust and passion with an unbridled purity and a spirituality beyond comprehension, I am glad the above words have been written as a rebuff (almost a magical chant) to the haters so that they can be cast back into the dark abyss where they belong. They don't get it. That's their problem (and curse).